On January 25, the Interior Department announced plans to propose wilderness designation for 12.28 million acres of the Arctic National Wildlife Refuge (ANWR). President Obama’s proposed wilderness plan would put the vast energy resources contained in ANWR’s Coastal Plain under lock and key, denying Alaskans and all Americans access to their abundant natural resources. The land grab is also part of a larger plan to starve the Alaska Pipeline, which would effectively put an end to any oil production in Alaska’s Arctic, where most of its energy is expected to be found. We’ve compiled a fact sheet to provide readers with information about Alaska’s enormous energy potential and the threat posed by the Obama administration to responsible energy development. The Bureau of Ocean Energy Management estimates that the Chukchi Sea contains 15.38 billion barrels of recoverable oil, while the Beaufort Sea contains 8.22 billion barrels of oil. Adding ANWR’s 1002 Area puts the total energy resource estimate at 34 billion barrels of oil in Alaska that the federal government either keeps entirely off limits or severely restricts. The National Petroleum Reserve – Alaska (NPR-A) is estimated to contain around 900 million barrels of oil and 53 trillion cubic feet of gas, about 9 billion barrels of oil equivalency. The Bureau of Land Management has held 10 lease sales in NPR-A since 1999. However, no oil has been produced from federal government leases owing to years of delay and red tape in permitting the necessary infrastructure to allow oil to flow out of NPR-A. In total, the federal government leases less than 3 percent of federal lands for oil and gas development nationwide, but much less than that in Alaska. How Big is 12.28 Million Acres—the Size of the Proposed Wilderness? At 12.28 million acres, the Obama administration’s proposed ANWR wilderness plan could cover more area than a strip of land that extends from D.C. to New York City and is 94 miles wide. It’s larger than the state of South Carolina. It covers an area of land that is larger than eight U.S. states and 5 times the size of Maryland. New York City’s Central Park could fit inside this area of land more than 14,569 times over. Adding existing ANWR wilderness areas (the Mollie Beattie at 7.16 million acres) to Obama’s proposal could cover more area than a strip of land that extends from D.C. to Boston and is 77 miles wide. The combination of existing ANWR wilderness areas and Obama’s wilderness plan equals 19.44 million acres, which covers 98.98 percent of ANWR. The Trans-Alaska Pipeline System was once capable of delivering more than 2 million barrels of oil per day to the West Coast. Now the Alaska Pipeline is operating at just one-quarter of capacity, even though the energy resources contained in the 1002 Area of ANWR are only 70 miles away. The unutilized capacity alone could accommodate twice as much oil as the proposed Keystone XL pipeline, for comparison. By blocking oil development in ANWR and elsewhere, the federal government is starving the Alaska Pipeline. Alaskan oil production has declined by more than 74 percent over the last three decades, from a peak of 2 million barrels per day in 1988 to 515,000 barrels per day in 2013. If oil production continues to decline, the Alaska Pipeline will become uneconomic. Without another way to transport the oil, Alaska would be forced to effectively cease any oil production. Declining oil production from Alaska means that the West Coast has gone from exporting oil to the rest of the country to the region of the country most dependent on OPEC imports. In 1980, Congress set aside 1.5 million acres of ANWR’s 19.46 million acres for future study of its energy resource potential, known as the “1002 Area.” It is the Coastal Plain area of the refuge, closest to the ocean. There are no trees, mountains or lakes in the area, and it is generally flat. Opponents claim that development in ANWR would adversely impact caribou populations. Yet, since energy production began in nearby Prudhoe Bay (on state lands) in 1977, the size of the Central Arctic Herd has grown more than 1,015 percent, from about 6,000 animals in 1978 to record levels of an estimated 67,000 caribou in 2009. Energy resources in ANWR’s 1002 Area could be developed using merely 2,000 acres, or less than 0.01 percent of ANWR’s total area. Announcing the proposed wilderness plan, Interior Secretary Sally Jewell described ANWR as “our nation’s crown jewels.” Unfortunately, this administration is determined to ensure that America’s “crown jewels”—our vast energy resources—remain in a lockbox. U.S. Geological Survey, Arctic National Wildlife Refuge, 1002 Area, Petroleum Assessment, 1998, Including Economic Analysis (April 2001), http://pubs.usgs.gov/fs/fs-0028-01/. See Bureau of Ocean Energy Management, Regulation and Enforcement, Offshore Energy and Minerals Management, http://www.boemre.gov/offshore/. According to the administration’s website, the outer continental shelf is 1.76 billion acres (http://www.boemre.gov/ld/PDFs/GreenBook-LeasingDocument.pdf page 1)and only 38 million acres are leased (Department of Interior, Oil and Gas Lease Utilization – Onshore and Offshore, http://www.doi.gov/news/pressreleases/loader.cfm?csModule=security/getfile&pageid=239255 page 4). That is a mere 2.16% of the entire Outer Continental Shelf. 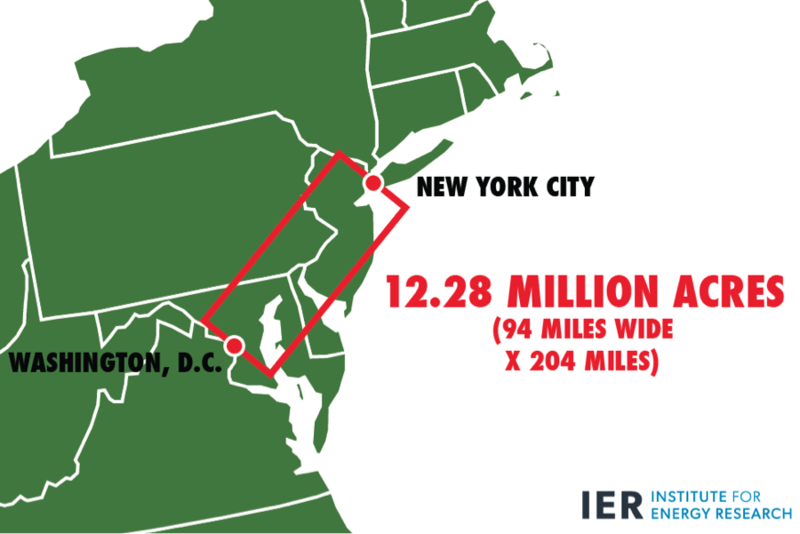 94 miles x 204 miles (D.C. to NYC) = 19,176 square miles, which equals 12.27 million acres. Figures calculated using WolframAlpha.com. Central Park is 842.88 acres. 77 miles x 394 miles (D.C. to Boston) = 30,338 square miles, which equals 19.41 million acres. Total combined current ANWR wilderness acreage plus Obama’s proposal is 19.44 million acres. The president has proposed designating 12.28 million acres of ANWR as wilderness. ANWR’s Mollie Beattie Wilderness Area is 7.16 million acres, bringing the total to 19.44 million acres. 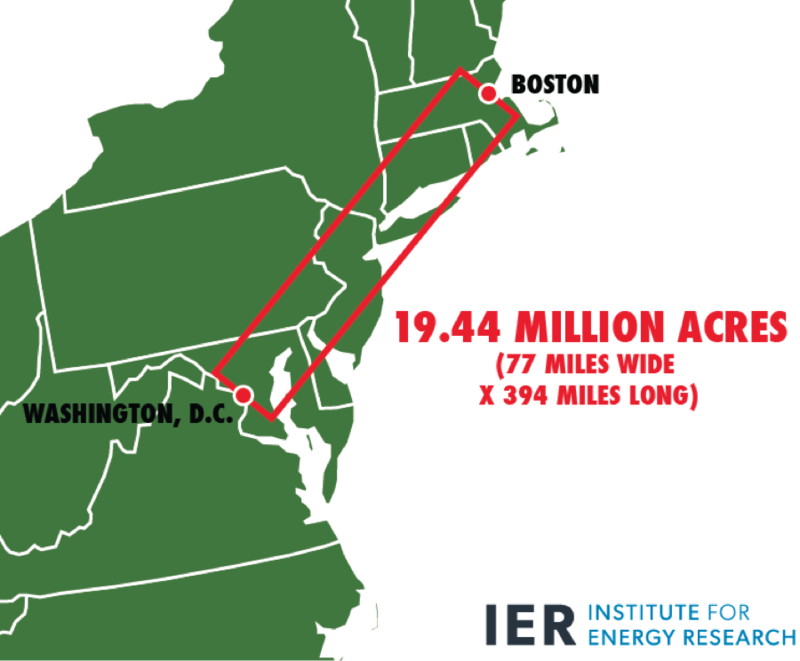 A strip of land that is 77 miles wide and extends from D.C. to Boston would cover about 19.41 million acres. U.S. Department of Interior, Facts: Environmentally Responsible Energy Production in Alaska’s ANWR, http://www.doi.gov/initiatives/ANWRmediafactsheet.pdf. Cameron et al, Central Arctic Caribou and Petroleum Development: Distributional, Nutritional, and Reproductive Implications, 58 Arctic 1, Mar. 2005, http://pubs.aina.ucalgary.ca/arctic/Arctic58-1-1.pdf and Alaska Department of Fish and Game, Press Release: ADF&G Reports Increase in Teshekpuk and Central Arctic Caribou Herds, http://outdoornewsdaily.com/index.php/archives/6821. Energy Information Administration, Potential Oil Production from the Coastal Plain of the Arctic National Wildlife Refuge: Updated Assessment, 3. Summary, http://www.eia.doe.gov/pub/oil_gas/petroleum/analysis_publications/arctic_national_wildlife_refuge/html/summary.html. See also, Arctic Power, Top 10 Reasons to Support Development in ANWR, http://www.anwr.org/topten.htm.